Perhaps you’d like to switch things up the next time you’re at Starbucks, and not always order your basic, go-to drink. Why not let the stars at Starbucks make your next decision? 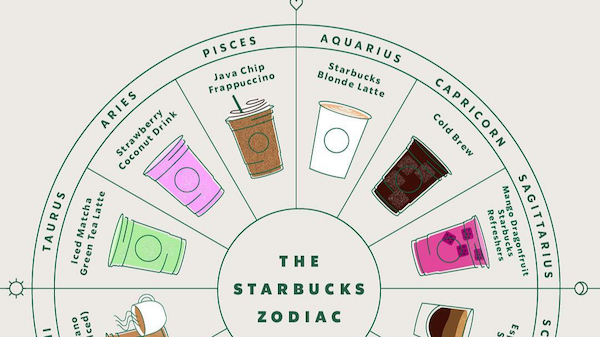 Starbucks Canada’s fun new graphic recommends the “perfect” drink for each zodiac sign, based on the characteristics often attributed to each personality. Adventurous Sagittarius, for instance, deserves a ‘Mango Dragonfruit Starbucks Refresher’, whereas homebody Cancer might find his or her cup of tea in a ‘Honey Citrus Mint Tea’. You could even refer to the chart to pick a beverage for that special Starbucks lover in your life. Check it out below.